Shares of Transocean (RIG), the world's largest offshore driller are down on news that several employees remain missing after a fire on the "Deepwater Horizon" rig off the coast of Louisiana in the Gulf of Mexico. It is exploring on behalf of BP. 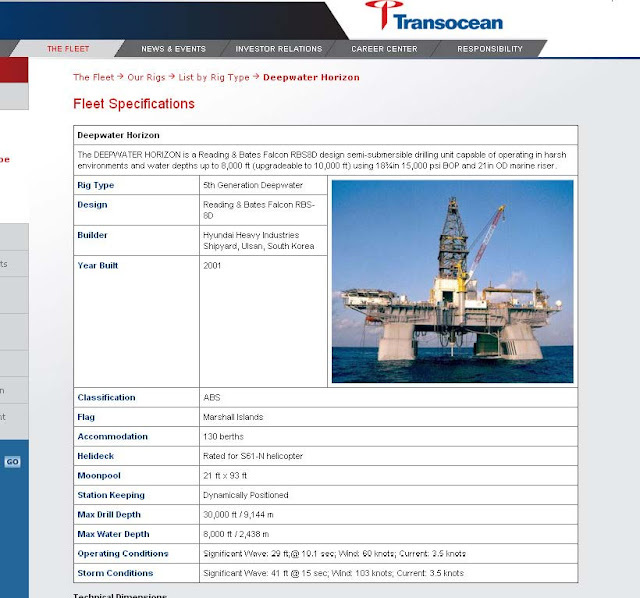 ZUG, SWITZERLAND--(Marketwire - 04/21/10) - Transocean Ltd. (NYSE:RIG - News) (SIX: RIGN) today reported a fire onboard its semisubmersible drilling rig Deepwater Horizon. The incident occurred April 20, 2010 at approximately 10:00 p.m. central time in the United States Gulf of Mexico. The rig was located approximately 41 miles offshore Louisiana on Mississippi Canyon block 252. Transocean's Emergency and Family Response Teams are working with the U.S. Coast Guard and lease operator BP Exploration & Production, Inc. to care for all rig personnel and search for missing rig personnel. A substantial majority of the 126 member crew is safe but some crew members remain unaccounted for at this time. Injured personnel are receiving medical treatment as necessary. The names and hometowns of injured persons are being withheld until family members can be notified.